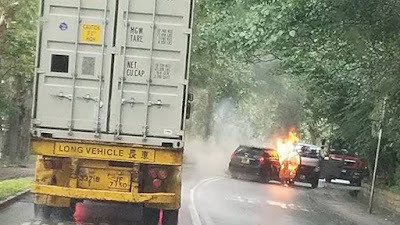 A gang of five robbers smashed their car into a van and snatched HK$5.8 million ($750k) from a father and son in Hong Kong in a highway robbery. A black car approached them from the opposite lane and rammed into their van, forcing them to stop. The car burst into flames. Two robbers in black masks and baseball caps got out of car, while three robbers got out of a second car parked behind the victims' van. Hong Kong police advised the public to hire security when transporting large sums of cash to avoid being easy targets for robbers.